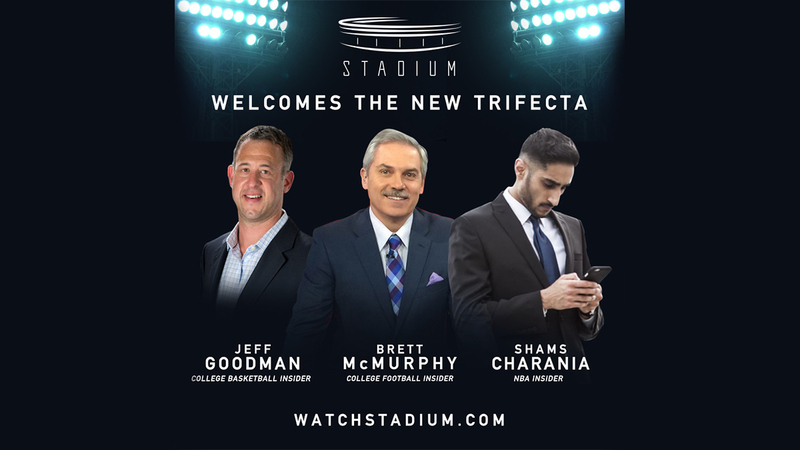 CHICAGO – Stadium, the first 24/7 multi-platform sports network, today announced the additions of Shams Charania, Jeff Goodman and Brett McMurphy. Both Goodman and McMurphy officially begin work today and will be featured prominently across Stadium’s various platforms. Charania will begin with Stadium on August 23rd and will also write for The Athletic. Charania (@ShamsCharania) arrives at Stadium as one of the most popular reporters covering the NBA. At just 24, Charania has established himself as a household name, breaking news at a prolific rate. Charania spent the previous three years at Yahoo! Sports, writing columns and breaking news across the league. At Stadium, Charania will play a pivotal role as lead NBA Insider and Analyst, appearing exclusively across various Stadium video platforms on a daily basis throughout the year, focusing on both regular and postseason play, the NBA Draft and NBA Free Agency. Goodman (@GoodmanHoops) comes to Stadium following five years as a national basketball Insider at ESPN, where he worked across various platforms to cover college basketball and the NBA. Previously, Goodman spent two years as the national college basketball writer at CBS Sports and held the same position from 2006-2011 at Fox Sports. Goodman is a multifaceted talent – he has been considered the preeminent news breaker in college basketball, has been a part of ESPN’s on-air coverage of the NBA Draft, has worked on the network’s coverage of the Final Four and has scored and conducted in-depth interviews with many of the top coaches in the sport from Brad Stevens to Mike Krzyzewski as well as elite players such as Kevin Durant and Deandre Ayton. McMurphy (@Brett_McMurphy) joins Stadium just days after breaking the biggest college football story of 2018. McMurphy obtained texts and images from Courtney Smith alleging abuse by her now ex-husband Zach Smith, longtime assistant to Ohio State Head Coach Urban Meyer. He spent the last five years at ESPN as a College Football Insider, breaking hundreds of stories across multiple platforms. Prior to joining ESPN, McMurphy wrote for CBS Sports, AOL FanHouse, and The Tampa Tribune. He began his career covering Odessa Permian High School, from Friday Night Lights fame, for the Odessa American. In 2010, he was nominated by AOL FanHouse for a Pulitzer Prize in the breaking news category, but was not a Pulitzer Prize nominee finalist. He has also been the recipient of 10 Football Writers Association of America Awards recognizing his writing. With Stadium, McMurphy will continue as a long-time voting member in the weekly Associated Press football poll along with the Heisman Trophy and several other national coach and player awards. Charania, Goodman, and McMurphy each will contribute across Stadium’s full daily studio lineup and also work to develop additional programming initiatives built around their respective areas of expertise.